If you don’t have an aversion to chocolate, you like brownies. That’s just nutritional science. If you are like most American families, your brownies come from a box. Have you ever tried homemade brownies? The difference is incredible. Don’t get me wrong, I do not dislike box brownies but homemade brownies pack more chocolate punch. On top of that, brownies are super easy to make from scratch. You dump stuff together in one bowl, mix it, pour it into a pan and cook it. 1. They are allergic to nuts. If you want a healthy snack, eat a handful of pecans or walnuts. Leave them off brownies. You are ruining them. 2. They like to be a flat chewy black shingle of barely-cooked batter. You cakesters can take your pan and go home. If we wanted a fluffy chocolate dessert we would have made chocolate cake. 3. Like any sane person, they will never turn away frosting. However, the non-frosted recipes below lack nothing. Most box recipes are really quite bland. You’ll wolf them down and like them, but to get a close-to-homemade flavor, I recommend Ghirardelli Dark Chocolate with Chocolate Chips. They take about 2-3 minutes to prepare. Cooking and cooling time is the same as homemade. My one suggestion is to use a cooking-sprayed aluminum foil sling in your pan for easy removal. If you don’t know how to make one, check out the video or read the recipe for Chewy Brownies below. I believe these brownies pack the most chocolate flavor, but that is up for debate in our household. My wife contends that they offer nothing more than the Chewy Brownies discussed below. Whoever is right, these brownies and the Chewy Brownies are a close #1 and #2. The only issue is that these are drier than box mixes, which can be a bonus for brownies n’ ice cream. You can find the recipe here. I’m sorry it is behind America’s Test Kitchen’s pay wall (14 days for free). These brownies are the best all-around brownies you can make. They have great chocolate taste and great texture. There are chunks of chocolate hidden inside and if you really pay attention there is a complementary shot of espresso flavor. The secret to the texture is a mixture of saturated fat (butter) and unsaturated fat (veggie oil). 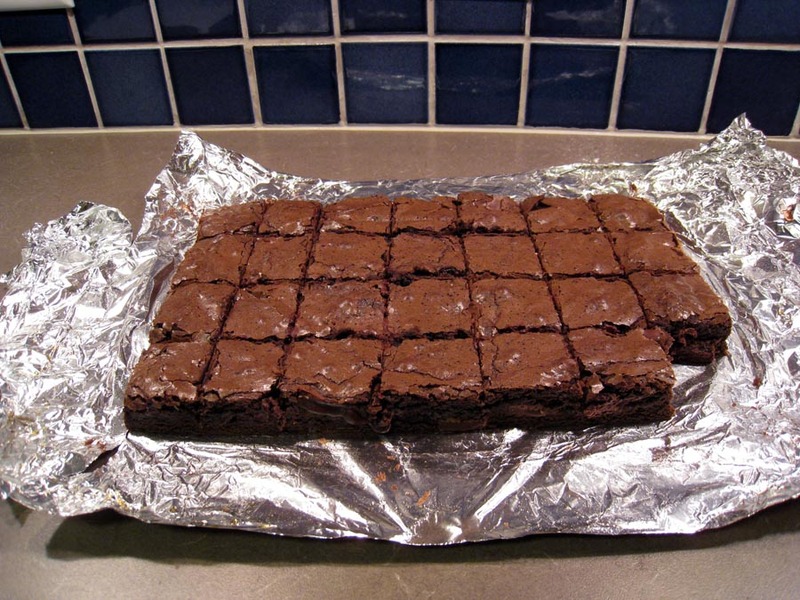 The unsaturated fat stays liquid at room temp giving the brownies a more gooey fudgy texture that has been the hallmark of box brownies since time began. The biggest disadvantages of these brownies are that they take more time to prepare (not much – maybe 15 minutes?) and are the most expensive because they use lots of different kinds of chocolate. 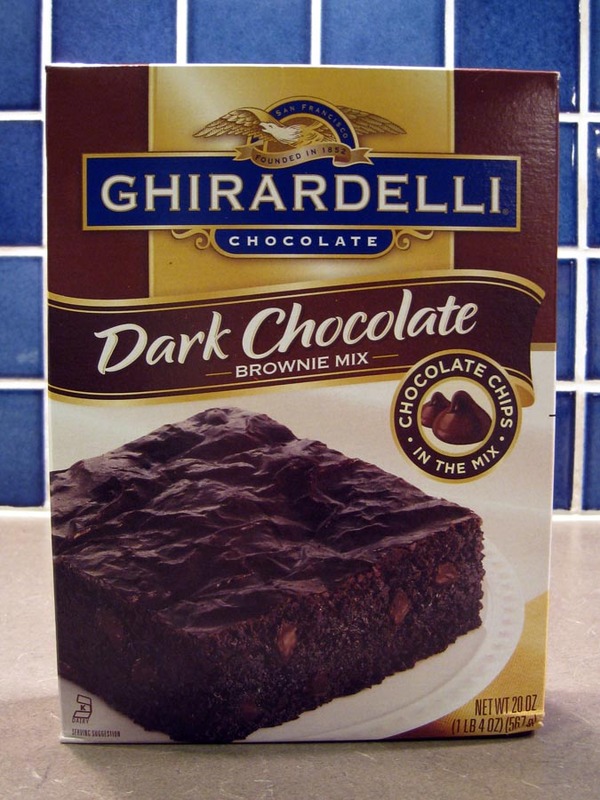 One thing to keep in mind price-wise is that these make about 1/3 more brownies than the Ghirardelli boxed version. You can find the recipe for free here where you can watch an instructional video or download the recipe. To get the written recipe you do have to provide an email address. NOTE: For whatever reason they make two measurement errors in the video (written recipe is correct). Use 4 tablespoons of melted butter and 1/2 cup + 2 tablespoons vegetable oil NOT 4-1/2 tablespoons of melted butter and 1-1/2 cups vegetable oil. 1-1/2 cups of oil would have these things swimming. Yuk! Last night at a Super Bowl party I decided to put the Chewy Brownies to the test. We pitted them against the Ghirardelli brownies and results were unanimous. Chewy Brownies are better. One attendee described the difference between them best when he said that they were “Sweeter, more chocolaty and also more bitter all at the same time”. If you think you can beat these recipes, please post your thoughts in the comments below. < Juicer Designs and Michael Graves Design Deluxe Lemon Squeezer: Fun or Fart? I would rate all of them equally unpleasant. Chocolate is poo.